Once upon a time, Disney Cruise Line believed that each ship’s adult nightlife district should have a unique theme. After all, cruisers love variety at least as much as they love consistency. Disney has broken with that tradition, by renaming the Wonder’s redecorated adult district on deck 3 forward “After Hours,” the same name used on the Disney Magic since 2013. Let’s take a look at the Disney Wonder lounges and see how they’ve changed! I like the look Disney introduced for After Hours on the Disney Magic; the suave, blue-gray and brushed stainless steel color scheme; the abstract, undersea motif of the main nightclub… So I don’t mind that DCL recycled After Hours for the Wonder. It’s a lot easier on the eyes than the busy motif of now-retired Route 66. It is worth knowing that these changes are entirely skin-deep. The substance of the three clubs of After Hours hasn’t changed a bit, but did it really have to? The main nightclub, formerly WaveBands, is now named Azure, and has been totally redecorated. The overall layout hasn’t a changed, though. The small stage and dance floor, the cozy semi-circular booths along the back wall, the long bar along the far wall, the groupings of comfortable seats and small tables… it’s all immediately familiar. Thanks to light gray walls and the cream-colored upholstery of the seats, when the lights are up, the room seems warm and inviting. When the lights dim, the room takes on whatever hue is projected by the lighting system, most typically soft shades of blue and blue-green that evoke an undersea feeling. Overall, there’s now little about the room decor that would distract from the entertainment, and there’s nothing wrong with that. It’s hard to tell the difference between Crown & Fin Pub and its former incarnation, Diversions. (It’s equally challenging to distinguish between this and its counterpart on the Magic, O’Gill’s Pub.) As with Azure, the room layout has barely changed. The difference is all in the decorative details, but unlike Azure, there are plenty of those to seek out. You’ll want to look closely at the pictures and nicknacks on the walls, which are a mix of purely “British” and references to Disney films set in England. Amidst references to British sports teams and cities, the bright red telephone booth, the bowler hats hanging on the coat rack, and drawings of Mr. Toad and Peter Pan’s London, there’s a group of British license plates with interesting abbreviations to puzzle over. One, “CRWN FIN,” is obvious. Less obvious is “DPW 7161,” an homage to Diana, Princess of Wales (you can figure out what the numbers represent). Altogether, it’s still a fine place to hang out, play pub games, and catch the latest sports action. Cadillac Lounge is still, very much, Cadillac Lounge. Perhaps there have been some small changes to things like upholstery. The significant change has been that the piano is now on a small stage at the far end of the room, rather than next to the entrance (consistent with Cadillac Lounge’s sister-club on the Magic, Keys). I think the move gives more respect and focus to the performers, so that’s an upgrade in my book. Radar Trap was the ship’s duty-free liquor shop, adjacent to the entrance to the pub/sports bar. Liquor sales have been moved up to Whitecaps on deck 4, and now Treasure Ketch is the name that hangs over the shop in After Hours. And now that it’s gone “dry,” what’s for sale? 90% Disney Cruise Line-exclusive Star Wars merchandise, and at least for now, a small selection of Crown & Fin Pub swag. I can’t wait to hear how that works out! If you ever wax nostalgic for Route 66, check out the posters hanging in the forward staircase between decks 3 and 4. Walt Disney Imagineering rarely misses a detail, so I’m going to assume this was not a mistake, but an example of an old, Imagineering tradition – leaving behind an homage to the current attraction’s predecessor. 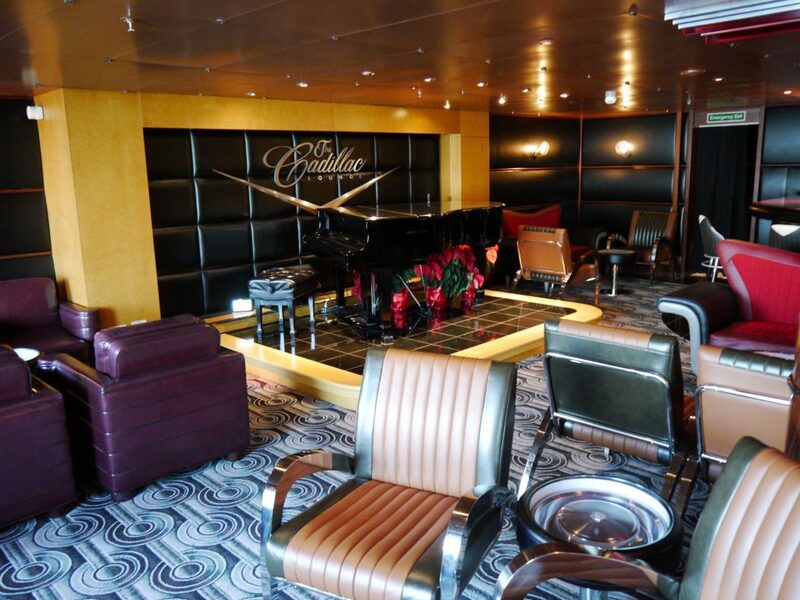 Most of the other lounges on board were untouched (at least, in meaningful ways) during the dry dock, but there are a few changes worth noting. As long as we’re already on deck 3, let’s move midship to more-or-less family-friendly Promenade Lounge, where cruisers often congregate prior to dinner. Although the “lounge” area of Promenade Lounge is not noticeably different, there was a major change made to the zone at the aft-most portion of the lounge, which had been the Internet Cafe. I’ll save the details for an upcoming post on “Less-Heralded Changes to the Disney Wonder.” For now, it’s enough to say that in an age where everyone who wants to stay connected to the outside world brings their own smartphone, tablet, or laptop computer, there’s little need for an Internet Cafe. In its place is a space where parents with toddlers can let their children safely roam. The family “nightclub” on deck 4 is now D Lounge (formerly Studio Sea) now has decor identical in all meaningful ways to that space on the other three ships of Disney’s fleet. It continues to host an array of family-friendly activities and game shows throughout the day and evening, interspersed with age-specific activities (adults-only cooking demonstrations, tweens-only dance parties, etc.). As with Azure, most changes are skin deep – color scheme, furniture, and carpeting. However, the port side entrance has been enlarged and made more welcoming by the addition of wide, glass doors, and some interior room dividers have been taken out to create a more open floor plan. From deck 4 we move to deck 10. As expected, but not promoted in Disney’s announcements, Outlook Lounge has been converted to the Concierge Lounge. That’s a big change to fans of Outlook Lounge, especially those who appreciated this snug vantage point when cruising Alaska. The lounge can be reached from the deck 10 midship elevator lobby, and via an outdoor entrance adjacent to the new, outdoor staircase to the Concierge Sun Deck on the port side of the forward stack. That’s right, there’s now a large, lovely, sheltered concierge sun deck above Outloo… I mean the Concierge Lounge up on deck 11 (even though it doesn’t show up on the official deck plan). The views must be glorious! Now, a word to fans of Outlook Lounge. All is not lost! The starboard side of Outlook has been preserved for any guest aged 18 or over, as an upper level for deck 9’s Cove Cafe. There are two ways into this near-secret hideaway. One, via a spiral staircase that leads up from Cove Cafe’s pool-side entrance. The other is a via door tucked away on deck 10, in an alcove on the starboard side of the forward funnel. So, the glass-half-full crowd would say that Cove Cafe was expanded AND the concierge guests gained a lounge on the only Disney ship that lacked one. The glass-half-empty crowd will note that their beloved deck 10 vantage point is about one-third the size of its former self. There’s always more to say, but I think that’s enough for now, don’t you? Look for more reports about the Reimagined Disney Wonder in the days to come. Dave Marx is a founder of PassPorter Travel Press, and co-author of PassPorter's Walt Disney World and PassPorter's Disney Cruise Line guidebooks. Thanks for the update, especially on the Cove and Outlook. I was very worried about loosing that important adult only space.